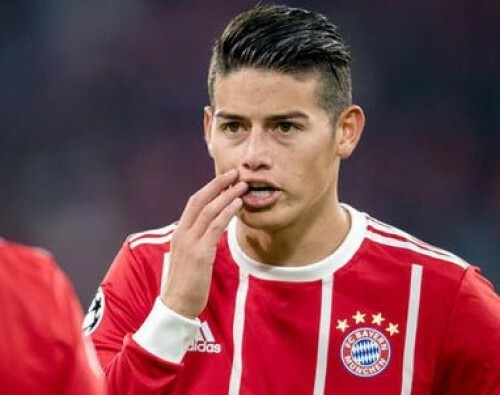 Bogota : Bayern Munich star James Rodriguez has arrived in Colombia and is set to join his national-squad teammates shortly for FIFA World Cup preparations. Thus far, 20 of the 35 players who made a preliminary cut for Colombia's World Cup team are in Bogota for training sessions overseen by head coach Jose Pekerman, reports Efe. James was in Medellin, Colombia's second city, on Tuesday taking part in a road-safety campaign, but the attacking midfielder is expected to arrive for training on Wednesday. Wilmar Barrios, a defensive midfielder for Argentine club Boca Juniors, said upon his arrival in Bogota that he was feeling well physically and ready to represent the Andean nation in Russia. Barrios took part in Tuesday's training session along with AC Milan defender Cristian Zapata and PSV Eindhoven defender Santiago Arias. Thus far, none of the practices have been open to the media. Colombia's football federation (FCF) said in a brief statement that the players did work in the gym and also took part in passing and tight-space drills. The national team will train in Colombia this week before flying Saturday to Italy for the final phase of its World Cup preparations. Before departing, the team will have a send-off on May 25 at El Campin Stadium in Bogota that will include a concert and a match featuring the players selected for the World Cup. On May 14, Pekerman unveiled his provisional list of 35 call-ups for this summer's World Cup in Russia, a roster that must be reduced to 23 by June 4, according to FIFA rules. Colombia will play a friendly on June 1 against Egypt in Bergamo, Italy. The South American team has been drawn into Group H of the World Cup along with Poland, Senegal and Japan.